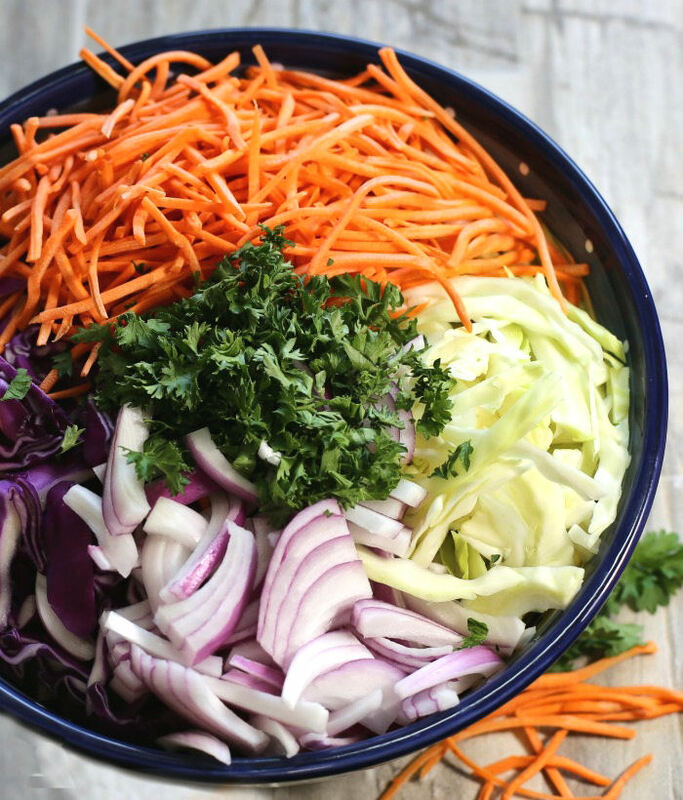 This Southern coleslaw recipe is so bright and colorful and filled loads of flavor from fresh vegetables and home grown parsley. It is a quick and easy side dish that is perfect for your summer barbecues and parties. 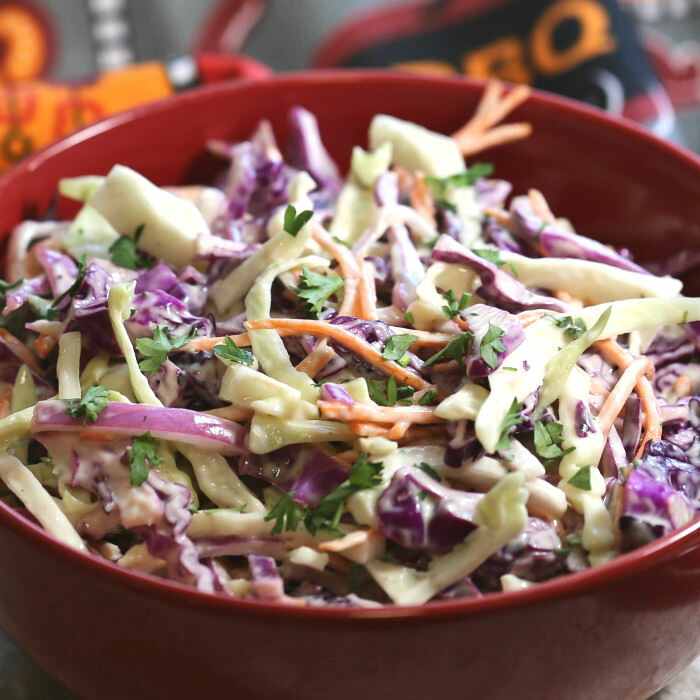 When my family asks me to make this Southern style coleslaw every time we have a barbecue, you know it has to be good. A few simple ingredients are all you need to make this sweet and tangy salad that will go with all sorts of proteins, from burgers to fried chicken. Summer is the time for fresh salads. I use them both as side dishes and also as main meals. Check out my Mediterranean chicken salad for a healthy and tasty recipe. The word coleslaw comes from the Dutch term koosla which translates as cabbage salad. It is a salad made mainly of finely shredded or chopped cabbage with a vinaigrette or mayonnaise dressing. The dressing often has a picked taste to it. There are two modes of thinking when it comes to making a great coleslaw. Some like to use a food processor to shred the veggies and others like to take a sharp knife to the vegetables and chop them. Really, it’s just a matter of personal preference. The problem with a food processor is that, although this makes the prep very quick, it is sometimes easy to over process the veggies so that they get mushy without much “bite” to them. But if time is a factor and you like smaller pieces, by all means use the food processor! Personally, I like a courser feel to my slaw, so I guess I’d go for shredded over chopped. I feel that texture is a big factor in the total impact of a dish. What the salad feels like in your mouth with the first bite can make a difference to the overall impression of it. I do often use pre-cut carrots cause even though I love the texture of a dish, who the heck has time to make tiny carrot sticks? 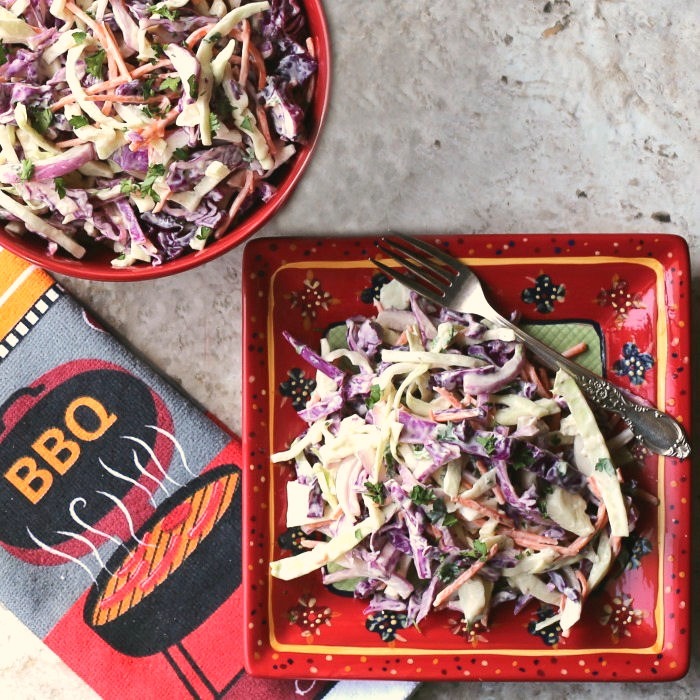 I like lots of color in my dishes, and this easy coleslaw recipe is no exception. I chose a half head of both purple and green cabbage, as well as some carrots, a bright Vidalia onion and, of course, some fresh parsley. I use fresh herbs to cook all year long but particularly so in the summer when it’s so darn easy to grow them! A normal dressing for coleslaw can be either vinegar or mayonnaise based. Mine is both! This tangy dressing is made of mayonnaise, sour cream, apple cider vinegar, Dijon mustard, seasoned with sea salt and cracked black pepper. The dressing is very easy to make. Just put everything into a bowl, give it all a good whisk and then pour over the vegetables. This Southern coleslaw has loads of crunch from the chopped fresh vegetables and the dressing is tart, sweet and tangy with tons of flavor. Trust me…after eating this coleslaw, you will never buy store bought again, and there is no need to since it comes together so quickly! 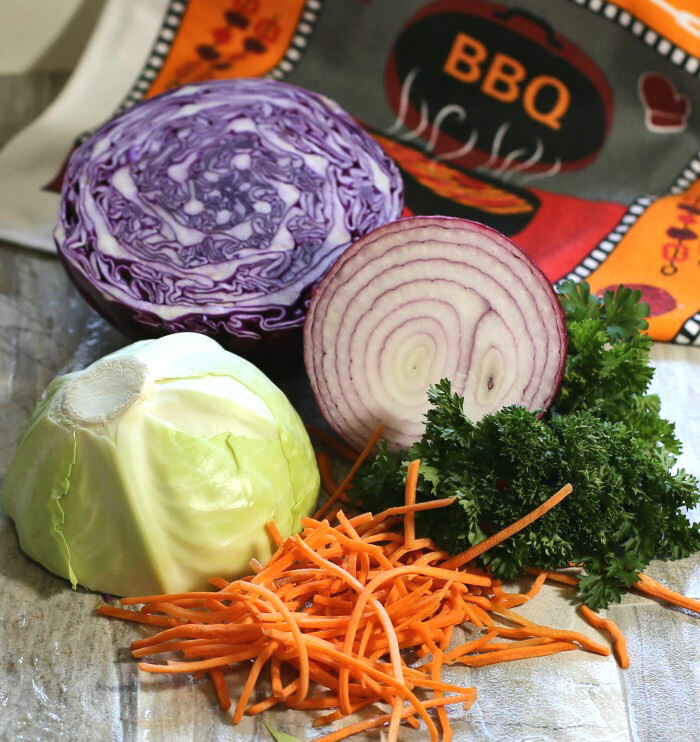 Coleslaw is such an easy recipe, just dress the veggies and chill but there are a few things to keep in mind to make sure that the taste turns out well. Save the dressing until you are ready to eat. We all love to make dishes ahead of time, to save time in the kitchen later but don’t add the coleslaw dressing to the greens until you are getting ready to eat. If you add it early, your veggies will wilt and get soggy. If you do dress it early, you might want to drain off some of the liquid before serving to guests. For food safety be sure to keep your dressing and your prepared, cut veggies chilled the entire time. And don’t leave uneaten coleslaw with dressing out after you have served it since bacteria could grow on it. Discard any that has been left out for two hours or more for safety’s sake. 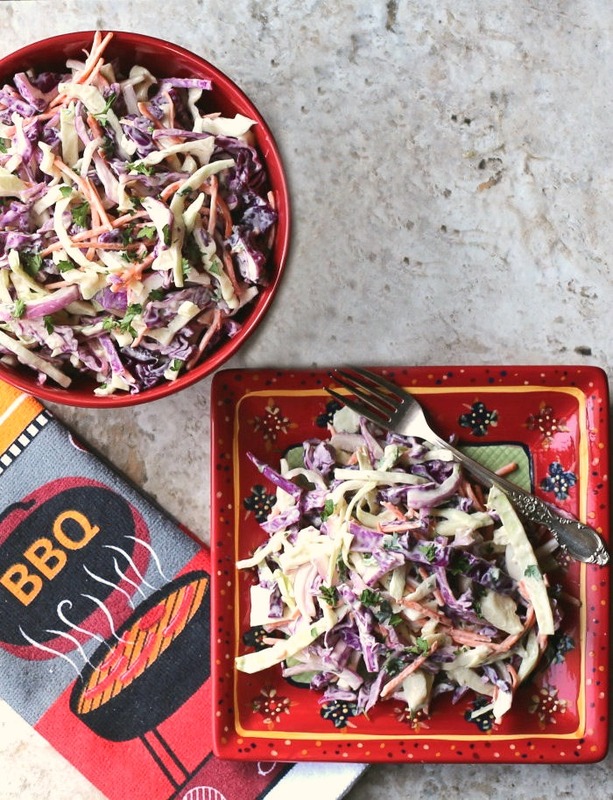 It’s perfectly fine to use veggies you have on hand for this coleslaw to suit your taste. Add in those that you love the taste of. If you don’t care for vidalia onions, white or yellow will work just fine. Not a fan of red cabbage, just sub it out for normal green cabbage. Want a bit more crunch or a sweeter taste? Use some slivered almonds or chopped apples. 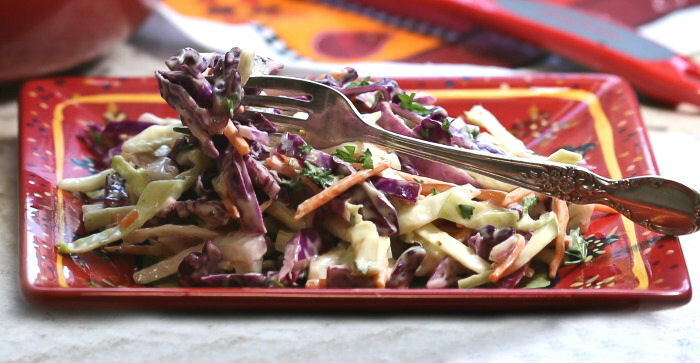 A great coleslaw recipe is more about the dressing than the actual vegetables. 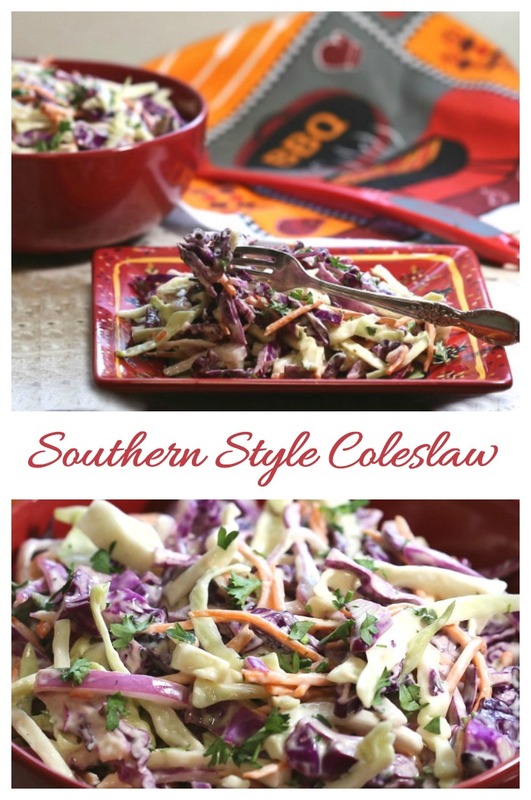 This Southern style coleslaw recipe is super simple, completely no-cook, and very easy to simply put together and then chill until serving time. Since this recipe is mayonnaise based, most of the calories come from the dressing. The veggies themselves have very few calories. I used a light mayo for my dressing and the salad works about to about 10 cups with each 1 cup serving having just over 100 calories. Not bad at all for a mayo based salad! If you would like a reminder so that you can make this salad for your next summer barbecue, pin this image to Pinterest. This Southern style Coleslaw recipe is both sweet and tangy and full of fresh ingredients and home grown parsley. Cut each cabbage half in two pieces and cut out the core. Very finely slice the caggage. Place the shredded cabbage in a very large bowl. Add the shredded carrot, sliced vidalia onion, and diced fresh parsley to the vegetable mixture and toss well. 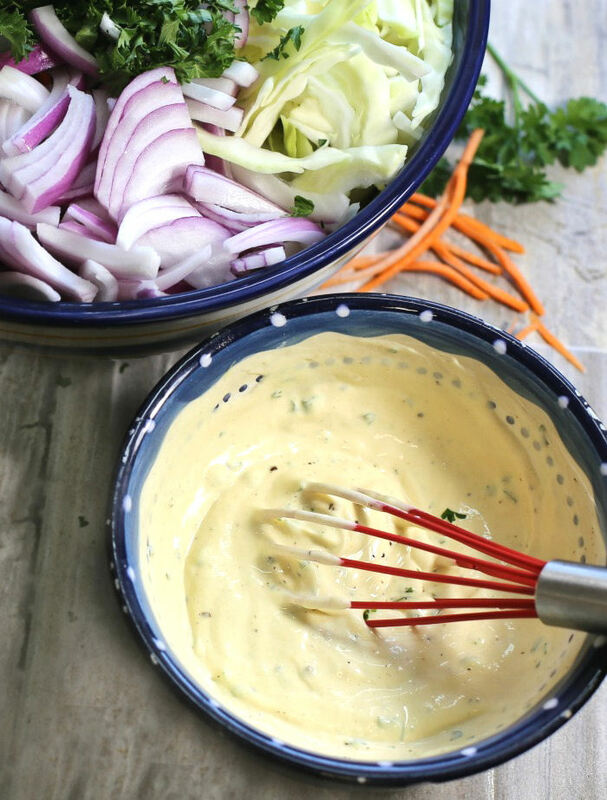 In a separate bowl, stir together the mayonnaise, apple cider vinegar, Dijon mustard, sour cream, sea salt, and pepper together. Taste and adjust seasoning as desired. Pour the dressing over the diced vegetables and mix well. The salad can be eaten right away or placed in the fridge for a short while so that the tastes combine well. Don't let it sit too long though, or the veggies could get soggy. The cut up coleslaw mixture will keep for about 3-5 days in an air tight container in the fridge. Just dress it before serving.